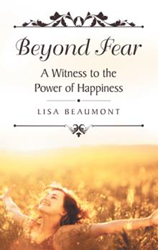 “Beyond Fear: A Witness to the Power of Happiness” (published by WestBow Press) is Lisa Beaumont’s memoir that speaks to her journey to rediscover her faith and rebuild her life following her husband’s suicide and her own struggles with PTSD and suicidal ideation. The book is available for purchase at: https://www.amazon.com/dp/B07DLP9YSG. Beaumont’s story discusses a process for overcoming fear that must be desired by the individual. She insists that the self-actualized inner process is the only way to create permanent and effective change and that it offers limitless potential for renewal and unending grace for redemption. Beaumont says that through her experience she learned to allow happiness to flourish in any circumstance and it has changed her life. Lisa Beaumont is a real estate broker who lives in St. Pete Beach, Florida. She teaches online classes designed to help people find and live their best life. She also serves as a life coach and mentor to those who wish to fast-track their growth. Beaumont offers her readers and those with whom she works wisdom garnered from years of faith-building and miracles. It is from that place that she works to lead others to their own space of emotional freedom and personal power.